1. Importance Very important Canada is an economic powerhouse. With a GDP over $1.5T, it is one of the largest economies in the world. Canada has a strong technology base, manufacturing base, and service sector. Canada is the largest trading partner of the United States. 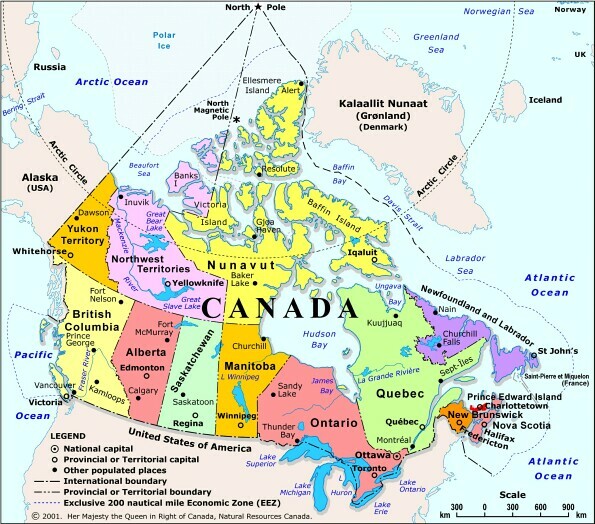 Canada is a resource rich country, with mineral deposits of iron ore, nickel, zinc, copper, gold, lead, rare earth elements, molybdenum, potash, diamonds, silver, and other natural resources of fish, timber, wildlife, coal, petroleum, natural gas, and hydropower. Canada's economy continues to grow impressively because of its consistent budget surpluses and conservative lending practices. 2. Wisdom Important As Canada goes, so goes the US. And as the US goes, so goes Canada. Canada has is a parliamentary democracy, a federation, and a constitutional monarchy. 3. Knowledge Important Canada with its vast resources and stable politics is always a good investment. 4. Current Assessment Good Canada is in a strong position for a recovery as the world economic conditions improve. 5. Future Assessment Good Canada is poised for a long, significant improvement in its economy as it and the world recover from the Great Recession. 2. Good 70% Canada is strong financially, in natural resources, and manufacturing and technology. 1. Importance Important The consumer is the driver of the economy, and consumer durable goods is a statement about the willingness of the consumer to buy goods that will require a significant investment of discretionary money, and a sign of their confidence in their own financial health. 2. Wisdom Important Consumer Durable Goods purchases are a sign of consumer spending strength. The stronger the purchases, the stronger the strength of the consumer and thus the economy. 3. Knowledge Important Consumer Durable Goods purchases need to be gaining as a percentage as much as the GDP to indicate a strong economy. 4. Current Assessment Good Consumer Durable Purchases continue to be greater than the GDP rate of 2%. 5. Future Assessment Good Consumer Durable Goods purchases are good, but will become better once the unemployment rate drops further. 2. Good 70% Consumer Durable Goods purchases are good due to the decreasing employment rate and increasing purchasing power of workers. 1. Importance Very important Gross Domestic Product (GDP) is perhaps the single most important economic indicator of an economy. 2. Wisdom Important As GDP goes, so goes the country. Like the US, Canada's GDP is driven by consumer spending. 3. Knowledge Important GDP above 2% is fair. GDP above 4% is good. GDP above 6% is awesome. 4. Current Assessment Fair The GDP growth rate in 2010 was 3%. GDP measurement using Purchasing Power Parity (PPP) was $1.33 trillion (2010 est.) GDP (official exchange rate): $1.574 trillion (2010 est.). 5. Future Assessment Fair Canada's economy is hindered by the overall slowdown in the global economy. 3. Fair 70% > 2% GDP growth continues to be an anemic 3%. It is expected to increase slowly as the world economy improves. 1. Importance Very important Inflation is a very important measurement of economic strength because it indicates the future strength of purchasing power. 2. Wisdom Important Inflation occurs when the demand exceeds the supply and prices rise. Strong economies control inflation. 3. Knowledge Important Inflation of more than 2% but less than 3% is healthy in a strong economy. 4. Current Assessment Good Canada's inflation rate in 2011 is about 3%. 5. Future Assessment Good Canada has kept inflation below 4%, and most often at or below 2%, for the past 10 years. 2. Good 90% < 4% Canada's inflation rate has not exceeded 4% in over 10 years. 1. Importance Very important Interest rates are key to the growth of an economy as they are set in a competitive environment with other countries, and signal the ease or difficulty in an economy to generate adequate GDP. 2. Wisdom Important Generally, the lower the interest rate, the better the opportunity for economic growth. However, very low rates can signal a troubled economy. The higher the rates, the lower the opportunity for strong economic growth. However, very high rates can signal an economy that is over-heating. 1. Awesome 80% < 2% Interest rates are likely to stay below 2% through 2012. 1. Importance Very important Personal income is an important measurement because the more money citizens have, the more they can spend and help grow the economy. 2. Wisdom Important Low personal taxes are necessary for citizens to retain an adequate amount of their income from which they can choose the goods and services to satisfy their life. 3. Knowledge Important High personal taxes, and therefore low personal income, is often associated with socialist or communist countries that provide a lot or all of the social services. Low personal taxes result in higher personal incomes which often leads to stronger, healthier economies. 4. Current Assessment Good Canada has a graduated personal income tax, with 26% as the top bracket. It is a moderate tax policy that strikes a balance between revenue for the government and income for the taxpayer with which they can buy the goods and services they want. 5. Future Assessment Good Canada's personal income tax policy is not likely to change. The economy is recovering at an adequate rate without further change to the personal tax code needed. 2. Good 70% Canada has a stable personal income tax policy. 1. Importance Very important Savings and investments fuel economic growth. 2. Wisdom Important The better the savings and investment rates and activity, the stronger the economy. 3. Knowledge Important A balance point between saving and spending, between investing and expenditures, needs to be reached for a country to achieve its economic potential. 4. Current Assessment Good The current savings and investment environment are good. Savings rates are low to keep interest rates low and encourage investment by businesses to incorporate and grow. 5. Future Assessment Good Savings and investments will continue to improve as the Canadian economy becomes a bigger player in world markets. 2. Good 80% Savings and investments will continue to improve as the economy recovers. 1. Importance Very important It is important for an economy to have a good current account in terms of imports, exports and trade balances to continue to be a healthy economy. 2. Wisdom Important Imbalances need to be rectified over time. 3. Knowledge Important A current account can help an investor see the relative advantages and disadvantages of a country vis-a-vis its competitors by analyzing the current account. 4. Current Assessment Good Canada is in a favorable trading position relative to its world partners. 5. Future Assessment Good Canada has had and will continue to have a strong position with respect to its current account because of its favorable trade position. 1. Awesome 70% Canada will continue to be in a favorable trade position with its partners. Description: Unemployment rate is the percentage of the population currently without a job. 1. Importance Very important Unemployment and total employment are key measurements of the health of an economy. 2. Wisdom Important The more people employed, the greater the economic output. 5. Future Assessment Fair Unemployment is expected to dip below 8% in 2011 but stay above 6% as recovery from the Great Recession is slow. 1. Importance Very important Business and capital formation address the ease and speed with which an economy can create business ventures and attract capital to produce goods and services from scarce resources. 2. Wisdom Important The easier and faster a country can react to market needs through effective and efficient business and capital formation, the stronger the economy. 3. Knowledge Important A market driven economy with entrepreneurial opportunity and readily available credit will yield a strong economy that will prosper in the good times, and weather the bad times. 1. Importance Very important Education is a key indicator of an economy's long term potential. 2. Wisdom Important The stronger a country's educational system, the better the prospects for the economy. 3. Knowledge Important 5% of GDP spent on education is "Good". 5. Future Assessment Good Canada has a long term and viable commitment to education. 2. Good 70% Canada has a persistent commitment to quality education about 5% of GDP. Description: Energy indicators, including domestic vs. foreign, fossil vs. green or renewable, etc. 1. Importance Very important Strong economies need ready access to large quantities of low cost energy to power industry and residences. 2. Wisdom Important Renewable and low carbon emission energy are key for a 21st century economy. 3. Knowledge Important Countries that place an emphasis on moving away from carbon based energy sources and towards renewable green energy resources will gain a competitive advantage. 4. Current Assessment Awesome Canada is an energy rich country, with tremendous opportunity in both carbon and low-emission power. 5. Future Assessment Awesome Canada has tremendous energy resources, both in the carbon based and hydrogen based sectors. 1. Awesome 90% Canada has proven reserves of carbon based energy, and strong opportunity for renewable, too. 1. Importance Very important Canada's environment is critical to its economic success due to the importance of its natural resources. 2. Wisdom Important Clean air, water, soil are critical to Canada's economic success. 3. Knowledge Important Canada needs to be an active party and participant in the key environmental initiatives around the world to control greenhouse gases and other pollutants. 4. Current Assessment Good Canada is a signee and participator in many environmental initiatives. 5. Future Assessment Awesome Canada will continue to show leadership and be highly participative in key environmental initiatives to control greenhouse gases and other pollutants. 1. Awesome 70% Canada is a leader in global environmental issues that help its national economy. Description: Financial indicators, such as equity markets, commodity markets, bond markets, exchange rates, etc. 1. Importance Very important Financial indicators, such as bond prices and yields, currency exchange and stock market value, are very important to understand the health of an economy. 2. Wisdom Important The better the financial indicators, the healthier the economy, and the better the chances of good investments. 3. Knowledge Important A growing stock market, low bond yields, a strong currency exchange rate, an acceptable budget deficit and other financial indicators are indicative of a healthy, strong economy. 4. Current Assessment Awesome Canada's financial indicators are indicating a continued recovery from the Great Recession. Bond prices are high, yields are low. The stock market is ascending. The currency exchange rate is strong, which favors exports and grows the manufacturing base. The federal government has had many budget surpluses, and the banking system is well capitalized. 5. Future Assessment Awesome Canada is positioned to benefit strongly from the recovery from the Great Recession, and it should show in continued improvement in the financial indicators. 1. Awesome 80% All the financial indicators point towards a strong recovery as the world economy slowly improves. 1. Importance Very important Industrial policy is specific action taken by the federal or local government to help industry compete in a global economy. 2. Wisdom Important Some countries need a strong industrial policy with supporting programs from the federal government to succeed. However, most countries that are market oriented and have governments that focus on regulatory environment, efficient capital formation, and tax incentives, do not have a strong industrial policy, and often do better. 3. Knowledge Important The approach to industrial policy needs to make sense for the country. Far too often a strong industrial policy is bad for a country and their economy because the federal government is not wise enough or capable of choosing winning sectors, industries, companies or technologies. 4. Current Assessment Awesome Canada has a weak industrial policy, which is actually good for the country, because it allows market forces to determine the best use of its resources, capital, credit and labor. 5. Future Assessment Awesome Canada has a weak industrial policy, which is actually good for the country, because it allows market forces to determine the best use of its resources, capital, credit and labor. 1. Awesome 90% Canada will continue to be market oriented, with a weak industrial policy, which will make it more competitive and successful in the world economy. Description: National Security indicators, including national defense, borders, intelligence, etc. 1. Importance Important The ability to protect one's borders, government, citizens, and way of life is critical to a country, assuming that the government is just. 2. Wisdom Important National security is essential to a healthy, strong economy. 3. Knowledge Important A strong national security is typically found in countries with strong economies. 4. Current Assessment Awesome Canada shares an open yet secure border with the US. It's military is strong and participates in world exercises and enforcement. 5. Future Assessment Awesome Canada has strong national security. 1. Awesome 80% Canada has strong national security and continues to make the strategic investments needed to keep it strong. Description: Political indicators, such as Stability of Government, Strength or Weakness of political parties, friendliness of political system to economic growth, etc. 1. Importance Important Political stability is often a precursor to a strong, healthy economy. 2. Wisdom Important A strong, stable, just political environment often yields a strong, healthy economy. 3. Knowledge Important Unjust political environments or parties will eventually fail. 4. Current Assessment Awesome Canada has a stable constitutional monarchy form of government with engenders a vibrant, market oriented economy. 5. Future Assessment Awesome Canada's political environment is solid and well suited to promoting a market oriented economy. 1. Awesome 90% Canada has a stable, just political system that is market oriented. 1. Importance Very important Demographics are key to understanding a country's economic potential and challenges. 2. Wisdom Important Demographics often dictate the economic future of a country. 3. Knowledge Important A young population will require more infrastructure investment in schools, roads, etc. while an aging population will require more investment in healthcare. 4. Current Assessment Good Canada has a nice distribution of population amongst the three age groups of young (0 - 14 years old), middle aged (15-65 yrs old), and old (65+), with percentages of 15%, 60% and 15% respectively. 81% of the population lives in urban areas. 99% of the population 15 years and older are literate. 5. Future Assessment Good The population distribution of Canada is not expected to shift dramatically over the next 25 years, creating a stable environment for continued, persistent investment in infrastructure for the young and healthcare for the old. 2. Good 80% Canada has a stable and attractive distribution of age amongst its 34 million citizens. Description: Technological indicators, such as Internet, telecom, mobile, medical, etc. 1. Importance Very important To compete in the world economy, a country needs to have leading technologies. 2. Wisdom Important Manufacturing, transportation, energy, medical, communications and computing, all need constant investment to keep pace with worldwide changes in technology. 3. Knowledge Important Technology innovation and use need to be pre-eminent if an economy is to thrive. 4. Current Assessment Awesome Canada has strong technology use and development in all areas, from fishing and resource management, to manufacturing, to Internet access and use. 5. Future Assessment Awesome Canada has a continued commitment to technology investment in all areas, ranging from Internet, communications and computing to medical, energy and transportation. 1. Awesome 90% Canada has a continued commitment to technology investment. Description: Transportation indicators, such as investments in roads, bridges, waterways, airports, ports, tunnels, etc. 1. Importance Important A strong healthy economy requires effective and efficient modes of transportation for goods and services, the military and citizens. 2. Wisdom Important A strong transportation infrastructure is a necessary part of a strong, healthy economy. 3. Knowledge Important Investment in the critical areas of transportation is necessary for a strong economy. It is also key during a recession when infrastructure programs often lift an economy by providing jobs. 4. Current Assessment Awesome Investments in Canadian airports, heliports, railways, waterways, merchant marine and ports and terminals continues to be strong. 5. Future Assessment Awesome The Canadian government is committed to persistent and consistent investment in transportation infrastructure. 1. Awesome 90% The Canadian government has consistently funded infrastructure projects.